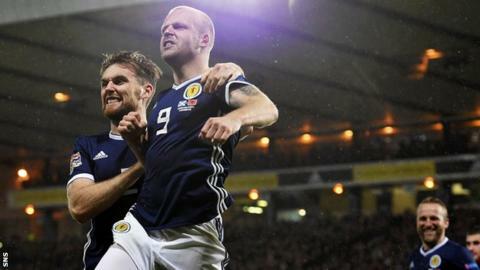 Scotland's energetic performance against Albania should be the "blueprint" for their upcoming games, says former defender Gary Caldwell. An own goal from Berat Djimsiti and a Steven Naismith header gave Alex McLeish's side victory in their opening Nations League match. It was only the Scots' second win in 2018. "The team right from minute one played with energy and I think that has to be the style," Caldwell told BBC Scotland. "When you have John McGinn, Callum McGregor, Andy Robertson, Kieran Tierney - the first thing you think about those players is energy. "They played on the front foot, they were aggressive, they tried to play in Albania's half and they did that for all of the first half and most of the second half and got their rewards by playing with such a high tempo. "Albania are better than they looked because of the way we played. They couldn't cope with playing at the tempo." McLeish's side passed up several first-half chances as they sought to atone for Friday's 4-0 humbling at home to friendly opponents Belgium and eventually made the breakthrough after the break. "Friday's so important because those experiences, while difficult, they're great for players because they show you how far they have to go," Caldwell said. "You learn the lessons from them and you come back stronger. "We played a Scottish style and played right against them and gave them problems from minute one. "But, when we lost the ball, we played with real intensity and energy to win it back and, when we had it, we had forward runners from McGinn, from McGregor, the two wing-backs were getting to the by-line. "Real energy, real intensity and that has to be the blueprint for how we play moving forward." Another former Scotland defender, Willie Miller, believes Scotland are now in a "perfect position" to win Group 1 of League C and progress to the play-offs in the event that they do not reach Euro 2020 via the conventional qualification process. The Scots travel to face Israel next, then host Portugal in a friendly, and finish the group with a double-header in Albania and then at home to Israel. "If Israel are of the same standard then I don't think we've anything to fear at Hampden," Miller told BBC Radio Scotland's Sportsound. "Away from home, it's different. "You've got to overcome different situations and they'll be better as well, but I still think, on the evidence of tonight, that we're more than capable of going there and not just taking something from the game but beating them. "It's set them up perfectly. It's set them up for that safety net and I think that's how you should look upon this tournament - a chance to go to the Euros. "You might get that group of death again and this is a competition that you should take very, very seriously."